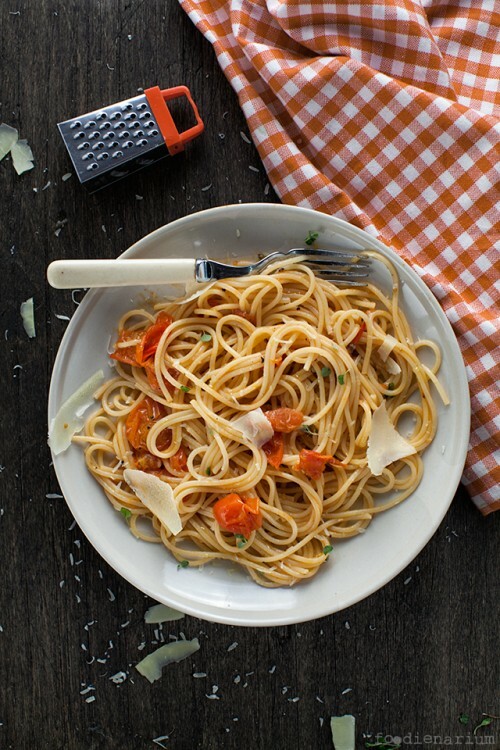 Pasta and quick to prepare meals continue their way in my blog. This time even without the participation of the famous English chef recipes of whom I have been sharing lately. 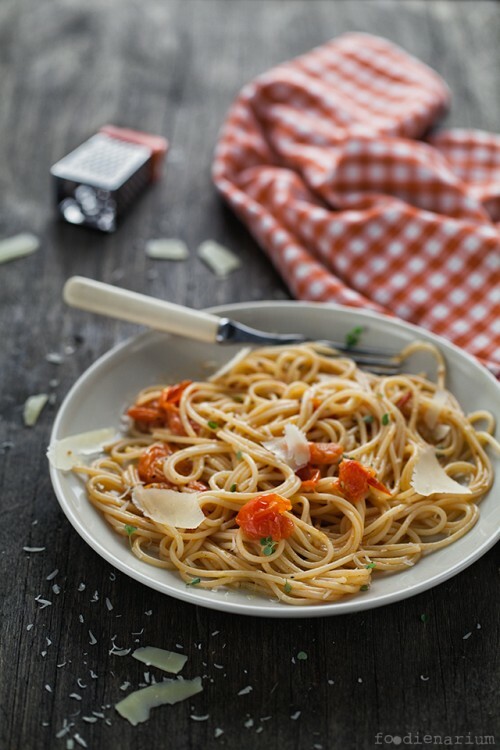 We all have been eating spaghetti since childhood and in combination with roasted cherry tomatoes, they can become simply magical in just 15 minutes. The recipe is inspired by Diva Eats Italia. First of all heat olive oil in a large pan on medium high. Add garlic & brown until golden but be careful not to burn the garlic. Add chopped chili and cook for a minute then add tomato halves. Be careful the oil will spit due to the water in the tomatoes so place a lid over the pan. Cook pasta in salted boiled water. Once cooked save about 1/2 cup of the pasta water and drain the spaghetti. After minute or two add salt and pepper. Cover the pan and let the tomatoes sweat all their juices. After about 8-10 minutes take the lid off of the pan and mash the tomatoes with a spoon. Once mashed, add about 5 basil leaves and cover sauce while pasta cooks. Don’t forget to turn heat off. Toss the pasta with the sauce and add some of the reserved liquid to loosen up. Add some more chopped basil over the top of the spaghetti and drizzle with a little bit of olive oil.